Heat the butter in a soup pot over medium heat. Add the garlic, onion, celery, and half the ginger. Cook, stirring occasionally, until the onions and celery are softened, 8-10 minutes. Add the broth, pumpkin, sweet potato, cinnamon stick, and nutmeg. 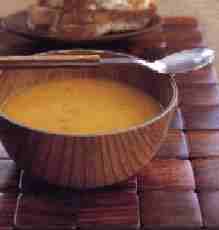 Bring to simmer and cook until the pumpkin is very tender, about 30 minutes. Remove the cinnamon stick and discard. Puree the soup until quite smooth. Strain through a fine sieve for an exceptionally smooth texture, optional. Return the soup to medium heat. Add the wine, milk, lime juice, and salt to taste. Stir to combine well and reheat just below a simmer. Whip the chilled heavy cream to medium peaks and fold in the remaining ginger. Serve the soup in heated bowls, garnished with a dollop of the ginger-flavored cream. Notes: Look for plain pumpkin pieces in the frozen foods section of your market. Canned pumpkin will not work quite as well in this recipe, although it can be substituted if fresh or frozen pumpkin is unavailable. This soup may be garnished with a scattering of toasted pumpkin seeds. For an elegant presentation, add a tablespoon of diced, cooked lobster meat to each portion.